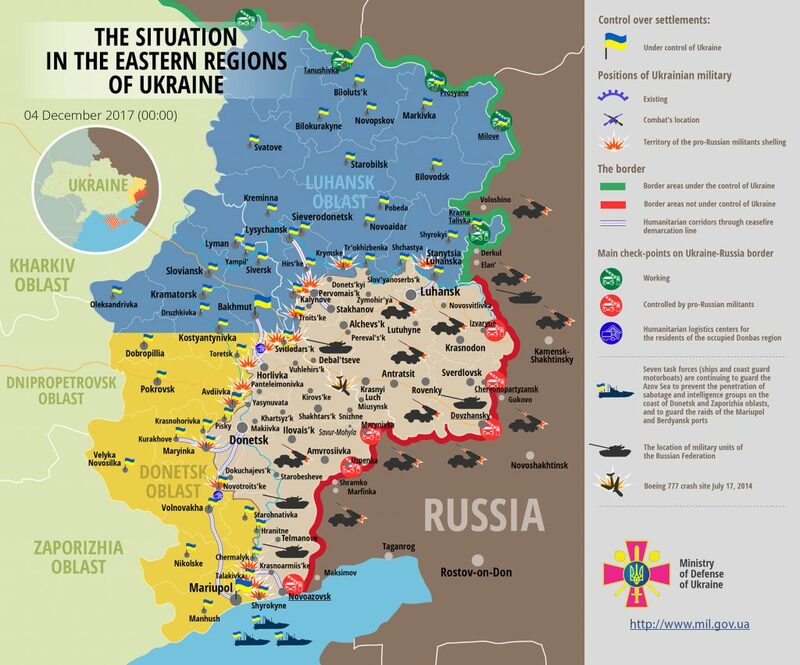 The situation in the combat zone escalated once again yesterday: Russia-backed militants violated the ceasefire 38 times and used Minsk-proscribed mortars and tanks, reported Ukrainian Ministry of Defense spokesman on ATO Colonel Oleksandr Motuzyanyk at a press-briefing at Ukraine Crisis Media Center. Ukrainian troops returned fire 22 times. In Luhansk sector, the enemy attacked Ukrainian positions 23 times. “Militants fired 17 rounds from Minsk-proscribed 120-mm mortars near Luhanske and Troitske and used 82-mm mortars near Zolote. The enemy also conducted precision attacks upon the positions of Ukrainian Armed Forces in Zhovte, Zaitseve, Zolote, Krymske, Luhanske, Malynove, Novhorodske, Novoluhanske, Novooleksandrivka, and Troitske areas using IFV mounted weapons, grenade launchers, heavy machine guns, and small arms,” elaborated the spokesman. Ukrainian troops returned fire nine times using grenade launchers, small arms, and IFV mounted weapons. In Donetsk sector, Russia-backed militants made 15 precision attacks. “The enemy attacked Ukrainian troops’ positions near Shyrokyne with Minsk-proscribed 120-mm mortars and fired 15 rounds from tanks near Avdiivka. Moreover, Russian proxies used 82-mm mortars in Avdiivka, Verkhniotoretske, Lebedynske, and Pavlopil areas. They fired a total of 29 mortar rounds,” Colonel Motuzyanyk said. In addition, they attacked Ukrainian troops’ positions near Avdiivka, Verkhniotoretske, Vodiane, Maryinka, Pavlopil, and Talakivka with grenade launchers, heavy machine guns, and small arms. A hostile sniper was spotted in Novotroitske area. Ukrainian troops returned fire in the majority of the incidents using the weapons not proscribed under the Minsk agreements. One Ukrainian serviceman was killed in action yesterday by militants’ 120-mm mortars near Shyrokyne. Four more troops were wounded in action: one in the same area, two near Troitske, and one near Vodiane. Report on the military developments as of December 3 is available here. Interactive data on the shelling: chronology shelling chart and the interactive map.